Driver Click features an IC with seven integrated high-current sink drivers, which can be used to drive a wide range of loads via simple parallel interface. These integrated drivers use high-efficiency MOSFETs for improved thermal performance. 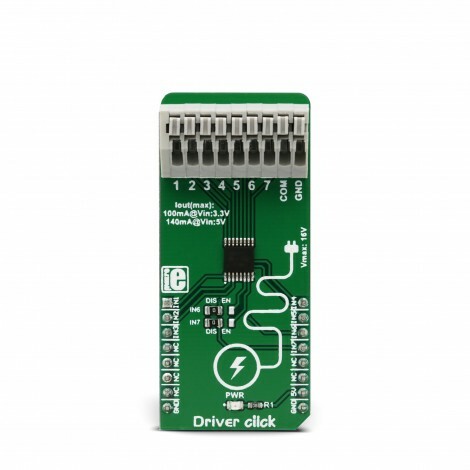 The DRV777 integrated motor and relay driver IC from Texas Instruments is the main active element of this Click board™. It is ideally suited for driving motors, relays, and similar inductive loads, as it features an internal free-wheeling diode for inductive kickback protection, on every channel. It operates with voltages up to 20 V, and by combining all the channels, it can sink up to 1A of current. 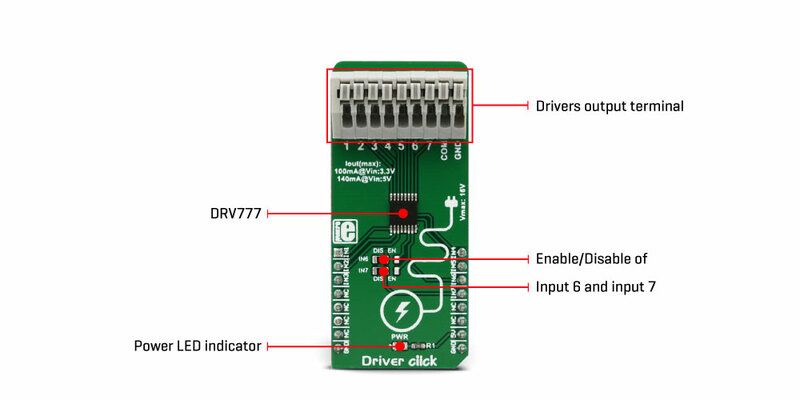 Driver Click retains the connection flexibility of the DRV777 IC, offering a nine-pole spring terminal that can be used to implement and realize a wide range of different applications. Featuring kickback protection diodes, high impedance control inputs, input RC snubber network for improved reliability, pull-down input resistors that allow tri-stating, up to 2kV ESD protection, and more, this Click board™ is a perfect solution for developing various types of motor driving applications, regardles of whether it is a stepper motor, brushed DC motor, brushless motor, or a combination of these. A special feature of this Click board™ is the possibility to combine integrated drivers in parallel, allowing to sink up to 1A of current. 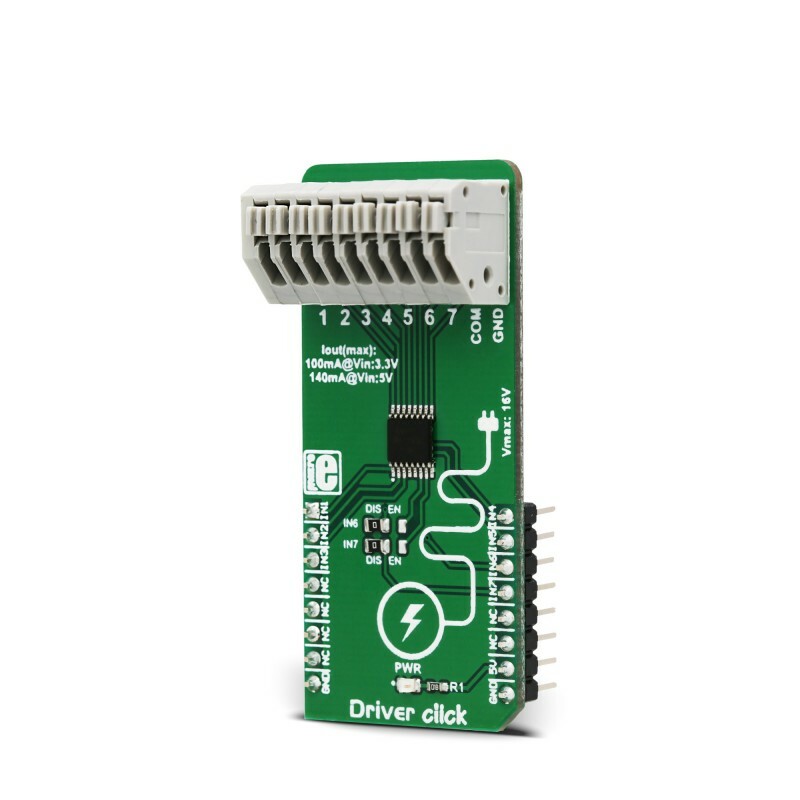 Driver click uses the DRV777, an integrated motor and relay driver from Texas Instruments. This IC has seven integrated current sink drivers. Each channel has a free-wheeling diode, connected to a common pin (COM) used for an inductive kickback voltage protection. This kickback voltage is typically observed at electromotors and relays, so the existence of such a protection makes this driver a good choice for driving motors, relays, and other inductive loads, which can generate back EMF. Each output is controlled by an input pin. Logic HIGH level on the input will result in the LOW state of the corresponding output, allowing a single driver to sink up to 140mA. The input logic voltage level can range between 1.8V and 5V, thus allowing a wide range of MCUs to be used. The input stage is filtered through an RC snubber filter, allowing the Click board™ to be used in a noisy environment. Logic LOW on the input pin will set the output driver to a HIGH logic level, allowing up to 16V (20V absolute maximum) between the pin and the ground. While in a HIGH state, the output driver will not sink current. For this reason, the input is equipped with the weak pull-down resistor, allowing inputs to be left floating or tri-stated, ensuring that the output drivers will not accidentally drive the connected load. The output drivers are capable of sinking up to 140mA per channel. However, the DRV777 IC allows outputs to be used in parallel, combining the current that can be sink. This allows sinking up to 1A of current when all the drivers are combined. In addition, more Click board™ can be combined, allowing sinking even more current. This Click board™ is equipped with the nine-pole spring terminal. Each output is routed to the terminal, with the addition of the COM pin and GND. This pin is a common cathode pin for all the free-wheeling diodes and a special care should be taken to connect this pin to the same voltage potential as the connected load. If not connected, a permanent damage might occur to the output drivers. GND for the load should be connected to the GND input of the nine-pole spring terminal. By using the output connector, various connections can be implemented with the same Click board™. Drivers can drive relays, motors, or a combination of these. 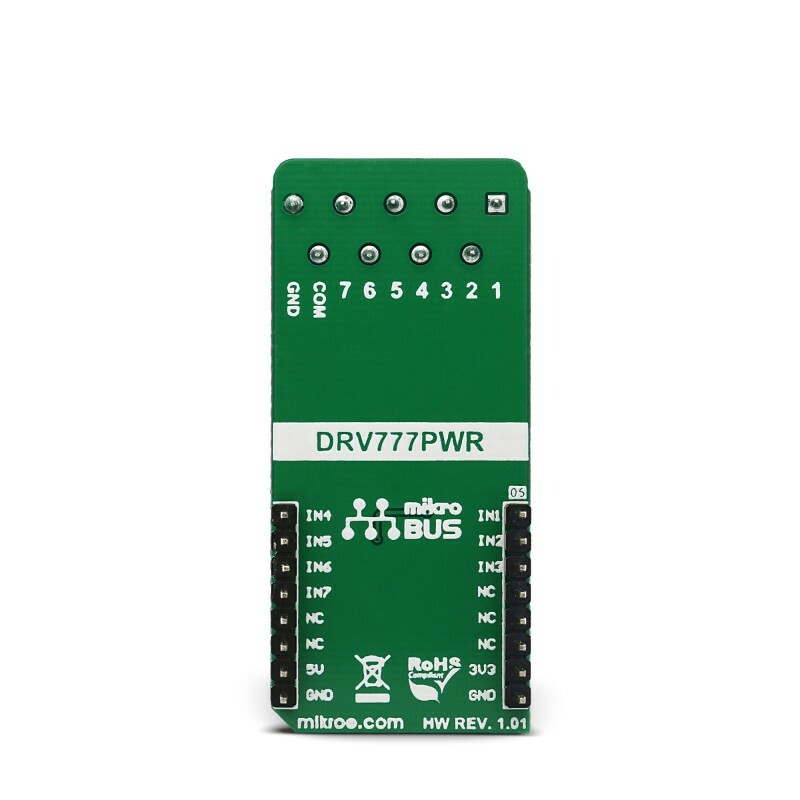 The DRV777 datasheet offers several connecting and driving solutions. It also offers more in-depth information about the IC itself. 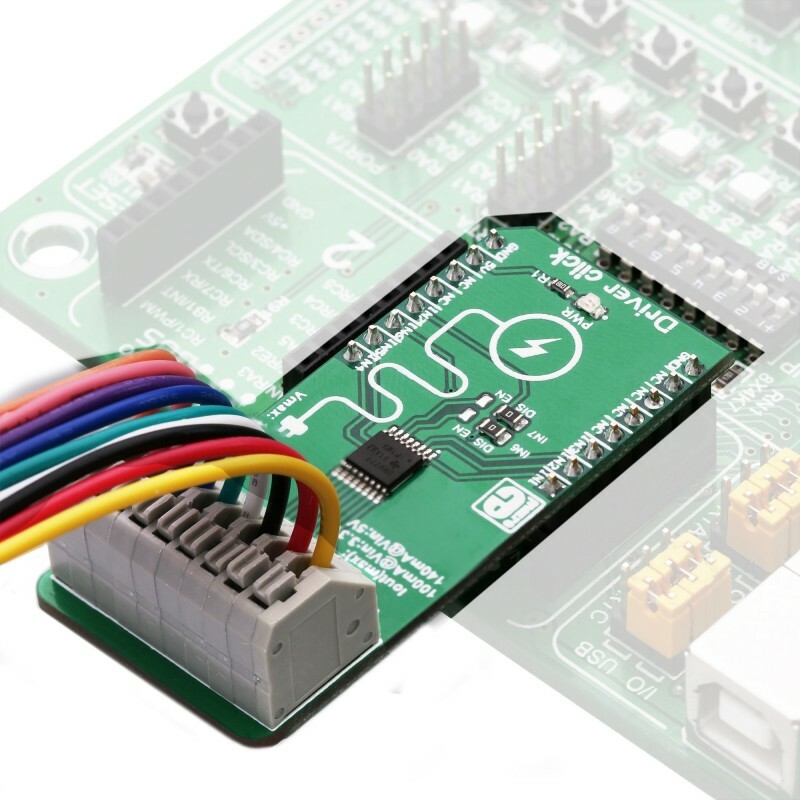 Although the IC uses only the 5V power rail from the mikroBUS™, the Driver click can be freely interfaced to either 3.3V or 5V MCUs. It does not require a special jumper for the logic voltage level selection. However, it has two SMD jumpers labeled as IN6 and IN7, used to enable or disable these driver inputs. It is done so to prevent eventual interference with the UART module in some cases, as these two pins are routed to the mikroBUS™ RX and TX pins. The complete pinout is contained at the table below. On-board modules DRV777, an integrated motor and relay driver from Texas Instruments. Key Features Seven independent sink current drivers, with the kickback protection and ability to be combined for a greater current sinking capacity. ESD protection of 2kV that exceeds JESD 22 specs, input snubber RC network ensures reliable operation, can be controlled by a wide range of logic voltage levels. This table shows how the pinout on Driver click corresponds to the pinout on the mikroBUS™ socket (the latter shown in the two middle columns). We provide a library for the DRIVER Click on our LibStock page, as well as a demo application (example), developed using MikroElektronika compilers. The demo can run on all the main MikroElektronika development boards. Library performs the control of the output pins (OUT1 - OUT7) by setting input pins (IN1 - IN7). void driver_setIN1( uint8_t state ) - Function determines state of output 1 (OUT1). Application Initialization - Initializes GPIO driver and selects which inputs will be set in operation. Bits from 0 to 6 (selectIN) select inputs from IN1 to IN7, respectively. Application Task - (code snippet) - Performs cycles in which selected inputs will be turned on for pulse width delay time one by one. When one input is turned on, he will be turned off after the desired delay time before the next input be turned on.